Character studies can be a mixed bag. Often the teacher will find what they want to find in a character’s story; proof-texting by means of name-dropping. Often studies will be driven by the teacher’s own agenda or fancies, moreso than a sensitivity towards the interests of the Biblical text(s). Often we will hear moralising tales not too different to “___ is bad; don’t be bad.” or “____ is good; be good too”. Alas, character studies are a dangerous game to play. So can they be done right? Enter Exhibit A: Family Portraits: Character Studies in 1 and 2 Samuel by Randy McCracken (website). Family Portraits has restored my faith in character studies being both an academic and yet devotional pursuit. The key here is that Randy has a wonderful grasp of the biblical text of 1-2 Samuel, and his numerous practical applications are driven by the text and not his own imagination. Here we will not find fanciful connections or interpretations of character’s motives, but neither will we find dry academia for academia’s sake. These two pitfalls are cancelled out through Randy’s tightrope-walking performance. 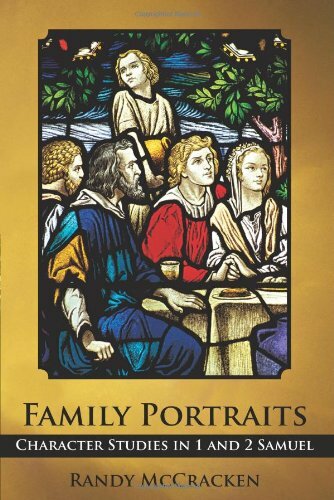 The purpose of Family Portraits is to examine the lives of various secondary characters in the text of 1-2 Samuel and see what the text tells us about these characters and how it would apply to ourselves. By secondary characters, I mean that one will not find Samuel, Saul or David, but rather Abiathar, Michal, and Joab. Randy traces four various family lines – Samuel, Eli, Saul and David – and highlights characters that are prominent enough for mention. This results in twenty-five character studies. To give an example of how the scholarly sits alongside the pastoral, I will share a few insights from a representative early chapter on Eli. Eli is a shortened form of “Yahweh is exalted”. Eli means “exalted”. We never see the full name in the text, only Eli. Is this a portend? Eli is introduced as sitting on the seat by the doorpost of the tabernacle (1 Sam 1:9). Randy points out that these words are loaded with double meaning that add to Eli’s initial exalted presentation. These words imply Eli is a “guardian or enforcer of God’s Law” (52), sitting on a throne at the entrance to the Lord’s palace. However, Eli’s behavior betrays that this exaltation is ironic. He misreads Hannah as a daughter of Belial (1 Sam 1:12-14, 16), despite his own sons being correctly characterised as such (1 Sam 2:12). Incorrectly judging by first impressions is a theme that recurs throughout the narrative, explicitly denounced in 1 Sam 16:7. This contrasts with the attitude Christians should have, according to 2 Cor 5:16, and as a leader of God’s people, Eli serves as a negative example here of following the standards of the world. Jumping ahead, Eli’s characteristics are used by the narrator to ironically present his downfall. It is not often that Biblical narrators describe physical characteristics; when they do, it is for a purpose. Even more surprising is that the narrator criticises a focus on outward characteristics, but then describes Eli as old (1 Sam 2:22; 4:15, 18), unseeing (1 Sam 3:2; 4:15) and overweight (2:29; 4:18). We see that Eli’s weight is due to him making himself fat on the offerings (1 Sam 2:29). His blindness is representative of his attitude towards his sons. His age is a sign that he is weary in the work of the Lord, continually telling Samuel to lie down when the Lord awakens him repeatedly. The narrator draws attention to the fact that these characteristics lead to his death (1 Sam 4:18). Eli falls off his throne and his weight killed him. Ironically, Eli’s heaviness (also translated “glory”) is only of the external and physical kind. By refusing to give glory to God (Mal 2:2), Eli was not exalted by the Lord. In the end, Eli had no glory (“heaviness” of the spiritual kind). This passage is a warning for us, that we may not lust after the evil that Eli did (1 Cor 10:6). As you can see, this is a study from getting one’s hands dirty with the text of Samuel itself, and not mere speculation. The narrator wants us to see Eli as a negative example of weightless glory, and a close reading of the text draws this out. This is characteristic of Randy’s work throughout the book. Family Portraits is a book from which anyone could benefit. There is deep study with numerous footnotes, but there is also a proliferation of personal applications drawn from the text. A or teacher pastor could pick this up and it would easily aid them in their study of 1-2 Samuel, but any interested believer could also read this alongside daily Bible reading. At this point I must confess that I may be a little biased since Randy McCracken is a fellow-teacher at Calvary Chapel Bible College York, my wife put together his family tree graphics, and that I have written this blog post under the threat of a ruptured friendship*. However, I can wholeheartedly recommend Family Portraits, and my own friendship with Randy only enhances my appreciation for this book and desire to build up believers though his scholarship.